This seems like a relatively obvious question, but I’ll answer it anyways! Peppermint is a natural herb with a very characteristic scent and flavor. While there are many synthetic versions of peppermint out there (like you might find in your candy canes, for example), when peppermint is studied for treating symptoms of GI conditions, the real peppermint oil that comes from the plant is used. Peppermint can be found in many different forms. I’m sure that many of you are aware of the recent craze surrounding natural oils. And if you are, you probably know that peppermint is readily available as an oil that can be placed on the skin, swallowed, or diffused into the air. 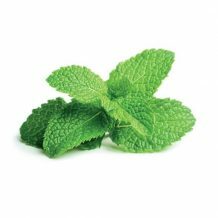 However, if you are wanting to take peppermint to treat a GI condition, it would be better to take a capsule that contains peppermint oil – this is what has been studied before and is also safest to use. It’s not entirely clear how peppermint works, but we know that it seems to have a “relaxing” effect on the GI tract. And this will make sense when we look at what peppermint can do for different GI conditions. When peppermint has been studied in dyspepsia, it has been studied in a product that also contains caraway oil. This product was called Menthacarin, but it does not seem to be available anymore. However, there are other products on the market that mirror it – 50mg of caraway oil and 90mg of peppermint oil. And Enteroplant is an identical product, but is only available in Europe. Altogether, the studies are not 100% convincing that peppermint + caraway is a great treatment for dyspepsia, but they are somewhat hopeful. The symptoms that improved the most were feelings of fullness and mild GI upset. Interestingly, caraway and peppermint are two of the ingredients in Iberogast, another herbal mixture that seems to help some people with symptoms of dyspepsia. It isn’t clear which ingredients are most effective in Iberogast, so it is possible that these are some of the big hitters. This is where the literature really gets good – there are a LOT of studies looking at using peppermint oil to treat Irritable Bowel Syndrome (IBS). And the results are really positive! The capsules used in these studies contained pure peppermint oil, and participants took 1-2 capsules three times a day in order to see these results. It is definitely worth pointing out that there are also a small number of studies that didn’t show any benefit from peppermint oil capsules. And the ones that did show benefit were all over the map. So this might be a real option for some people with IBS, but there will also be some people that find it doesn’t help at all. This could be a real option for those with IBS, particularly those that experience a lot of gas, abdominal pain, and frequent trips to the bathroom. There is also a chance that peppermint oil (possibly combined with caraway oil) could help to make some people with dyspepsia a little more comfortable, particularly if they struggle with feeling full. Peppermint oil is considering generally safe for human consumption, which is a relief, considering we all consume it at some point in time! However, that label was never meant for high doses of peppermint oil capsules, taken 3 times a day, for a long time. We don’t know much about what that can do to someone, so if you might be planning to take this for the long haul, be cautious. And we have very limited information on whether or not this would be safe to use during pregnancy. As with any situation, you would need to weigh the risks and benefits. If you are able to have a healthier pregnancy because the peppermint is helping your symptoms significantly, then that might be a reason to continue using it alongside consultation with your doctor. But because we do not know the risks to the child, it should be avoided in all other situations. If you are trying to find a peppermint oil capsule so that you can follow the dosing used in studies, those studies mostly used two products: Colpermin and Mintoil. Unfortunately, these are products that are only found in Europe, and do not follow any quality standards or guarantees (i.e. use at your own risk). However, there are some peppermint capsules made by Nature’s Way, a company that undergoes quality verification and certification, that might be worth considering. No matter which product you choose to buy, always ensure that it is a high-quality product and that the company stands behind its manufacturing process. Interested in learning more about Iberogast, another herbal mixture that some people use to treat GI symptoms? You can check out that article here.